Imagine placing a spoon in a glass of iced-tea. The spoon will appear bent at the surface of the liquid, as the light that hit the spoon refracts when it travels from the liquid to air. Now imagine adding some sugar to the tea and according to a 200 year old prediction by Fresnel, you should see two spoons instead of one! The double image has its origin in the molecular structure of the sugar. Fresnel was the first to suggest that light can be circularly polarized and that the difference in refractive indices between the left- and right-circularly polarized components underlies the optical rotation that is observed in sugar solutions. Sugar molecules are chiral, that is, they lack mirror-image symmetry, and they can in principle exist in either “right” or “left” handed configurations. However, almost all naturally occurring sugars are right-handed. Similarly, DNA, amino-acids and proteins are all of one hand. Adding the right-handed sugar molecules to the iced-tea changes the symmetry properties of the liquid, as it now becomes chiral too. The liquid is no longer described by a single refractive index, but by two refractive indices: one for left- and one for right-circularly polarized light. Fig. 1: (a) Experimental setup to observe the refractive splitting of light in a chiral liquid. (b) CCD image of the split beams as they traverse respectively 8, 12, 16, and 20 interfaces. Given that there are two refractive indices, Fresnel predicted that a light beam refracting into or out of a chiral liquid will not only bend, but should also split into its two circularly polarized components . That this phenomenon has gone unnoticed for so long is easily explained by the smallness of the splitting. The difference in the refractive indices for the two circularly polarized light components is typically less than a few parts in a million, and so the separation between the two images is expected to be extremely small. 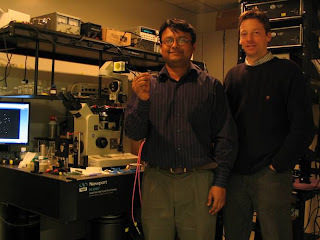 Nevertheless, Ambarish Ghosh and Peer Fischer from the Rowland Institute at Harvard have recently succeeded in imaging the splitting of a light beam in a chiral liquid . The two physicists sent a laser beam through a stack of prismatic liquid cells filled alternately with chiral liquids such that at each interface the separation between the circular components increased until a double image could be clearly seen on a CCD camera. This is shown in the adjoining figure along with the experimental setup. Ghosh and Fischer also closely examined what happens to a light beam that reflects inside a chiral liquid. In their recent paper in Physical Review Letters  they show that the “law of reflection” does not apply for liquids that lack mirror-image symmetry. The circularity of light reverses at a mirror and so the light beam experiences a different refractive index upon reflection. It follows that the angle of reflection does not equal the angle of incidence in liquids with handed molecules. Compared to optical rotation, which requires liquid cells with long path-lengths, the refractive and reflective splitting of light should be much better suited to detect chirality in minute liquid volumes, since it occurs directly at the interface. The group is exploiting this advantage and is currently working on a chiral detector that will require only a few nanoliters of liquid (see figure). In a recent set of experiments the Harvard team also demonstrated that a magnetic field can cause a light beam to split  in a similar fashion to that observed in chiral liquids. A. Fresnel, Ann. Chim. Phys. 28, 147 (1825). Very interesting! I just like the idea that, with modern sophisticated instruments, we can do so much on fundamental principles of Physics. Who knew that those 'laws of refraction & reflection' still had inside it such interesting things to offer to 21st century Harvard Physicists! Congratulations, Prof. Ghosh & Prof. Fischer for choosing this problem to explore. Felt good realizing that, despite all progresses in complex directions, Physics still remains beautiful. One just needs to design such elegant experiments. Thanks, 2Physics for bringing it to our focus. Very interesting experiment. This must have some potential applications that I can't guess. Would it be possible to elaborate that?